Australian Prime Minister Malcolm Turnbull has said he will deliver a national apology to victims of child sexual abuse. Mr Turnbull's pledge follows the conclusion of a four-year inquiry that found tens of thousands of children had been abused in Australian institutions. The crimes, over decades, took place in institutions including churches, schools and sports clubs. The apology would be given later this year, Mr Turnbull said. "As a nation, we must mark this occasion in a form that reflects the wishes of survivors and affords them the dignity to which they were entitled as children, but which was denied to them by the very people who were tasked with their care," he told parliament on Thursday. 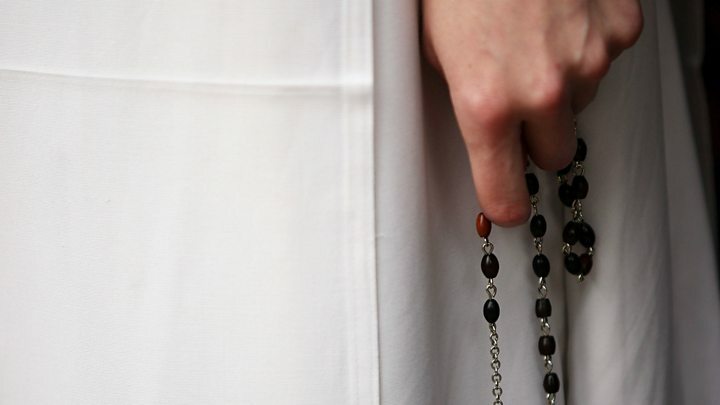 The royal commission inquiry, which concluded in December, made more than 400 recommendations, including calling on the Catholic Church to overhaul its celibacy rules. "It is not a case of a few 'rotten apples'. Society's major institutions have seriously failed," it said. Mr Turnbull said his government would consult abuse survivors about what should be included in the national apology. He also called on state governments and institutions to join a national redress scheme for victims. "We owe it to survivors not to squander this moment," he said. The Australian government has already pledged A$30m (£17m; $23m) to the scheme, which would pay victims up to A$150,000 each. It would also provide counselling and other services. The inquiry heard testimonies from more than 8,000 victims, but it said the true number may never be known.